In poker, smart players know that the best thing to do with a weak hand is dump it. Not so the United Nations. Libya is doubling down on backing the failing Government of National Accord (GNA), hoping that by reopening its UN base in the capital, the previously fortified “Palm City Complex,” things will improve. They are also sending some sending in Gurkha “Security Guards,” but nowhere near enough to actually make a difference against the Tripoli-based militias. For two hundred years the Gurkhas have been the most feared force in the British Army. If anyone can destroy the Tripoli militias, they can, but what’s the point? Why shore up an unelected five-man government? The GNA was created by the UN two years ago to unite the country and end the civil war. Instead, the GNA’s cabinet is unable even to unite Tripoli, which is “controlled” by various militias. Hence the need for Gurkhas to stop militias overrunning the ostentatious UN compound, “Palm City,” which is itself a provocation to the Libyan people. The elected parliament in Tobruk, rival to the GNA, is increasingly calling the shots. Thanks to the increasingly popular Field Marshal Khalifa Haftar, Tobruk now controls the majority of the country and its oil infrastructure and ports. The idea that the GNA will ever rule over areas held by Tobruk is laughable. But, having created the GNA, the UN remains determined to back it. Last week Haftar banned GNA personnel from visiting the East — so much for the alleged French July détente efforts. What makes the UN case so hopeless is that outside powers are split and at odds – in particular France and Italy — over who to support. One European country is even pondering supporting the son of the late Colonel Gaddafi — that is how desperate the situation has become. Italy supports the GNA because militias in western Libya are in a position to stop people-smuggling. Italy faces parliamentary elections in 2018 and politicians are aware the electorate will focus on the immigration issue. Most migrants from Libya end up in Italy, not France, and for Paris migration is less important than combating terrorism. 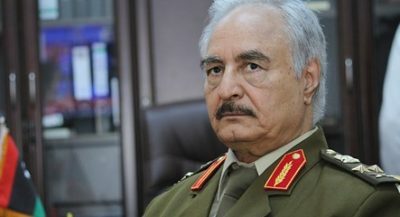 Haftar is already combating Islamist terrorists in Libya, making France a natural ally. Russia showed its support for Haftar by inviting him aboard an aircraft carrier earlier this year. It has since hedged its bets, insisting it is working for reconciliation by talking to all sides, including the Misrata-based Al-Bunyan Al-Marsoos (BMB) militia. Yesterday the BMB militia surprisingly pledged its support for an unknown multi-millionaire businessman Basit Igtet, a Swiss based Libyan with alleged links to Israel and designs on becoming President of Libya! One thing must be made clear: The BMB Militia are enemies of Haftar’s LNA. Britain is trying to have it both ways. Foreign Secretary Boris Johnson, who presumably facilitated the Gurkhas’ deployment, visited Serraj to show support, flying east to see Haftar on the of 24th August at his headquarters, urging the field marshall to keep to the “unsigned” agreement announced in Paris. But why should Hafter do so? It’s farcical. The United States has kept a low profile thus far. Though rumour has it there has been a shift in policy in the last few days. Expect Rex Tillerson to get involved in the near future. With the big powers so divided, and the GNA experiment having failed, the new UN envoy, Ghassan Salame, a Lebanese politician, said by some to be distrusted by the Russians, would have done better to dump the GNA. Instead Salame is planning to send UN staff and “British Gurkhas,” disguised as “guards,” into the Tripoli cauldron, putting many lives needlessly at risk to support a failed and unelected government. When will the UN throw in its losing hand? And when will Russia return to the aces it had when it supported Haftar?